Friday is my happy day. Its the day I drop Little Lady at nursery and spend a happy hour or so meandering home through the town shopping. Our town has a thriving street market four days a week, and Friday is one of those days. I stop to buy local cheeses, free range farm eggs, fresh fruit and vegetables, olives, pots of bulbs. I carry my favourite spotty Paperchase bag and feel quite jaunty . 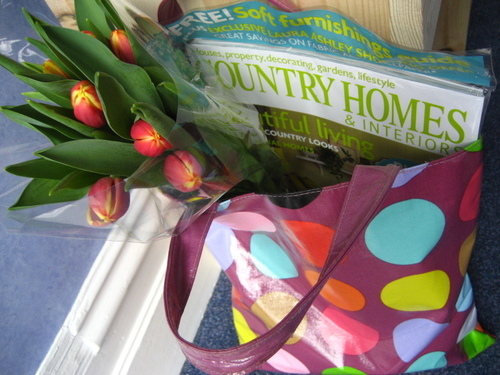 I treat myself to a magazine, a bunch of pink tulips and some beautiful greetings cards with inspiring colours. I love hearts, I think you could say I officially have a thing about them. I hoard pictures with hearts on and heart decorations, I'll show you some time. Our town also has 8 (yes EIGHT) charity shops - I have to be in the mood for these and today I felt like visiting one or two. I bought a pair of Oasis jeans for £2 (too boring to photograph but I am suitably impressed with myself for finding such a bargain), and this beautiful box. 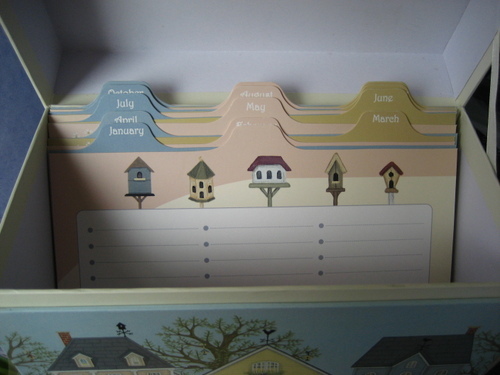 Looky inside, its for keeping Birthday cards in. A bit too organised for me really, I usually adopt the mad-dash-at-the-last-minute approach to card sending, but the box was so pretty I thought I could keep my stationary, cards and envelopes in it anyway and pretend to be very organised and in control. And yes it was £2 also. I love Fridays. Te felicito por tus adorables creaciones!!!! Eres mi inspiración!!!! Me encantaría que estuvieras más cerca!!!!!!!!!!!!!!! 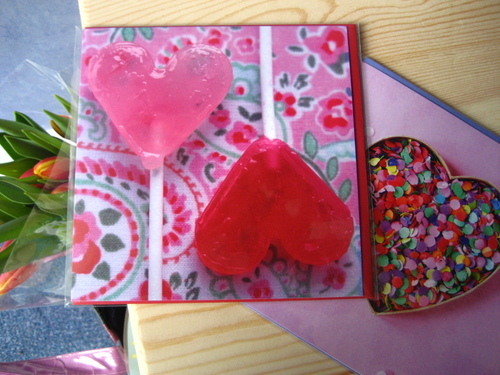 I love hearts too, and this photo of yours will sooner or later end up in my blog, I am warning you! (just like the other one). In fact, you are giving me a lot of photo inspiration here! We have the same taste for beautiful and colourful things and those small but special moments. Lovely lovely box! Where in North Yorkshire are you, Lucy? I live in West Yorkshire. Just wanted to congratulate you on your blog too! Your friday sound great - ho I wish to have one of that shopping bag filled with tullips and home magazines.... ;-) And nice cards, nice cards! Looking forward to more postings! 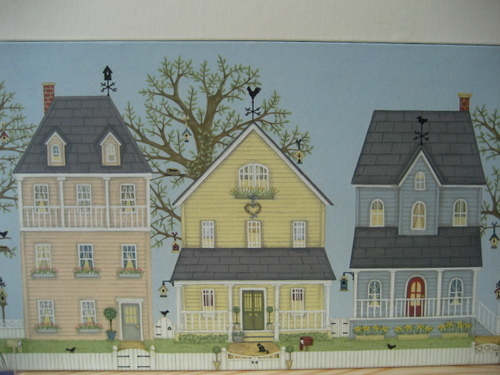 Hi Lucy, I love what you have posted so far, I've got one of those gorgeous card boxes, I want to live in one of the houses on it!!! I have 7 charity shops in my part of Cardiff and thats just one road, my mum--in-law helps out in one so we get some great items form her, the stories she could tell about some of the nasty things that come into the store...you can imagine!! I'm going to add you to my fave places to visit right now!!! Great find Lucy, really lovely. I thought I'd posted a comment to this post Luce, but clearly not - silly Clairey. Anyway I am loving your charity shop finds. Nearly moving day for me - eeeeeeeeeeeek! I'm presuming that is your name from the other feedback you have. Like you I'm fairly new to world of blogs. I only discovered them just before Christmas, and what a fantastic discovery! Reading each day about all the talented, crafty homemakers out there is like getting a Christmas gift every day to open! I was excited to see that you have only had your own blog for 3 days, as I have been toying with the idea of starting my own too. I'm frightened it takes over and I won't have time to craft though. Like you I live in North Yorkshire, relocating here last September. We've moved 120 miles, so my family and friends are a two and a half hour journey away. But like you I have an "attic studio" that doubles as a guest room, and a new house that needs making into a home. Well good look with your blog, I look forward to keeping up with your homemaking. Welcome! Glad we persuaded you, I really enjoy your photos on Flikr, I love how colourful they are so I'm looking forward to seeing more in the context of this blog. Hope you have a lot of fun and meet some new friends, the blogging community is great, you'll love it!